Why do poor people often vote against their material interests? This puzzle has been famously studied within wealthy Western democracies, yet the fact that the poor voter paradox also routinely manifests within poor countries has remained unexplored. This book studies how this paradox emerged in India, the world's largest democracy. Tariq Thachil shows how arguments from studies of wealthy democracies (such as moral values voting) and the global south (such as patronage or ethnic appeals) cannot explain why poor voters in poor countries support parties that represent elite policy interests. He instead draws on extensive survey data and fieldwork to document a novel strategy through which elite parties can recruit the poor, while retaining the rich. He shows how these parties can win over disadvantaged voters by privately providing them with basic social services via grassroots affiliates. Such outsourcing permits the party itself to continue to represent the policy interests of their privileged base. 1. Introduction; 2. An elite party's struggles with poor voters; 3. Why rich and poor voters support an elite party in India; 4. Why an elite party turned to service; 5. How service wins votes; 6. When service fails: the impact of rival strategies; 7. The argument in comparative perspective; 8. Conclusion; Appendix A. Variables, sources, and summary statistics; Appendix B. Additional tables and figures; Appendix C. Supplemental survey information; Appendix D. List of information in online supplement. Tariq Thachil is an Assistant Professor in the Department of Political Science at Yale University, Connecticut. 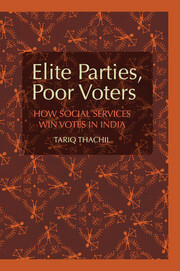 Thachil's doctoral dissertation received the 2010 Gabriel A. Almond Award for best dissertation in the field of comparative politics from the American Political Science Association and the 2010 Sardar Patel Award for best dissertation on modern India in the humanities, education, fine arts, or social sciences from the University of California, Los Angeles. His articles have appeared in American Political Science Review, Comparative Politics, Contemporary South Asia, and World Politics.